Among the tasks of the EDA will be to co-ordinate the military equipment of EU member states to ensure there is greater efficiency and synchronisation of the military capacities of member states in the conduct of humanitarian and peacekeeping projects. It also sponsors research on measures to improve the protection of military personnel engaged in such missions. The EU has already participated in peacekeeping operations in the Balkans and in Africa, most recently in Chad and the Democratic Republic of Congo. These initiatives have won widespread approval and support and the intervention in Congo, in particular, may have saved thousands of lives. If this was all the EDA was up to, how could any of us complain? We are all in favour of peace, in favour of rescuing populations from starvation, war and natural disasters, and doing everything we can to protect our soldiers engaged in such laudable undertakings. But, regrettably, this is not all the EDA is up to and this is not all the Lisbon Treaty would facilitate, if endorsed by the Irish people. The EDA was the brainchild primarily of the European armaments industry, the huge corporations that make vast profits from manufacturing the instruments of war. 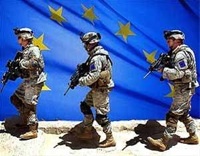 Of course EU peacekeeping forces require armaments to accomplish their tasks, but the sale of arms for such purposes would not keep the European armaments industry in being. Its purpose is to compete with the American armaments industry in selling arms to armies around the world, including such states as Pakistan, India, Saudi Arabia, Israel and a host of dictatorial regimes in Africa and elsewhere. The EDA was established on July 12th, 2002, by the EU Council of Foreign Ministers, but could not be part of the EU’s institutional structure without a change of the treaties. The Lisbon Treaty seeks to remedy that. On October 3rd, 2006, the EDA published An Initial Long-Term Vision for European Defence Capability and Capacity Needs. The document attempts to project military requirements by 2025 and in that context it states Europeans will make up just 6 per cent of the world’s population, with an average age of 45. What would be the point of these observations in a document dealing with Europe’s long-term military requirements were it not contemplated that military operations would be undertaken to deal with migratory pressures or resource demands? Nowhere in the document is there any suggestion that EU military operations would require UN sanction. Neither is there anything to that effect in the Lisbon Treaty. It does see a problem with the use of weapons that have indiscriminate effect, but states lamely: “Serious thought needs to the given to the future utility of unguided munitions (and of aircraft that cannot use smart weapons), as well as cluster bombs, mines and other weapons of indiscriminate effect.” The implication being that only the “utility” of such weapons should be considered. Not surprisingly it speaks of the EU becoming “a global security actor” (“security” being a cosy synonym for “military”). By incorporating the EDA in the institutional structure of the EU, the Lisbon Treaty seeks to accord status to a project that, in part, is about boosting the manufacture of arms for sales around the world and seeks to further plans for wars for resources and for the containment of migrants.